Capri Italy has always been one of the most cosmopolitan islands in the Mediterranean, beloved by the international jet set and Hollywood celebrities. Whereas once the cafès and restaurants were favorite haunts of artists, writers, intellectuals, and the aristocracy, today you are more likely to run into movie stars, celebrity athletes, and recognized faces from TV and entertainment. 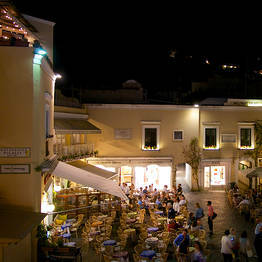 You can, of course, settle in at a table in the Piazzetta and keep your eyes peeled for famous passers-by, but it's also fun to celebrity spot along the lanes of Capri town in a lighthearted selfie treasure hunt. Though those in the gossip business are looking to sell a scoop - that money shot of lovers kissing aboard their yacht anchored outside the Blue Grotto or a night of wild clubbing - most celebrity hunters on Capri (and there are many) simply want an innocent snapshot of themselves with their favorite stars in a keepsake selfie!. A tip: Capri's celebrity visitors rarely are out and about until after about 6:00 pm, so you have to stay the night on the island to cross paths with them! The classic route for the evening "passeggiata" walk runs from the Piazzetta to the Quisisana, and then continues along Via Camerelle, lined with luxury boutiques. If you want to have a front row view of the passeggiata and not miss anyone, grab a table on the outside terrace at the Quisisana for a cocktail and people watching. 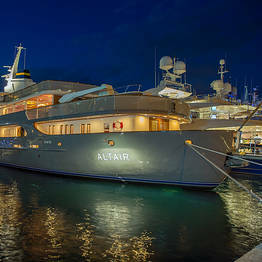 Most celebrities stay on their luxury yachts moored near Marina Piccola right beneath the Faraglioni) or at the Capri Marina. They stay on board all day to avoid the tourist crowds, and disembark on the island only in the evening to dine at one of the island's restaurants or spend the evening at a club. Those who opt to stay in a hotel usually choose the luxury Capri Palace or the Quisisana. Da Paolino: known as the "restaurant to the stars"